A woman with a vital connection to High Country News died on Nov. 19. Though her name did not often appear in the paper, Muriel "Tommie" Wilcox Bell helped sustain the publication during its formative years. The story began when Tommie bought her husband, Tom, a subscription to a Wyoming-based tabloid called Camping News Weekly. Tom grew friendly with the publisher and contributed an environmental column called "High Country." Soon, Tom and Tommie had contributed a few thousand dollars as well - and the shaky little publication became theirs, debts and all. Tom renamed it High Country News and declared it an environmental voice for the Rockies. He knew this was an act of dubious wisdom. You had to be crazy (or visionary) to try to make a living that way in Lander, Wyo., in 1970. While Tom's passionate advocacy earned him accolades throughout the nation, Tommie wholeheartedly supported him and pursued her own good works. She raised three boys (Alan, David and James). After the youngest turned 15, the couple adopted three more children (Victor, Rachel and Christine). Tommie was a leader in her church and grew an outstanding garden - no small feat given Lander's unforgiving 60-day growing season. On top of all that, she provided a warm welcome to a scruffy assortment of young people lured to Lander by Tom's writing - including my husband and me. When we first met Tommie, she was just starting to raise her second family. She was nearly 50, with a face creased by the sun. Her voice had some gravel in it. She was quick to laugh and shrug off difficulties. The Bells had sold their ranch to support the paper. At one point, Tommie didn't even have enough money to buy new snow boots for her kids. Still, she stood by Tom and his bold little newspaper. 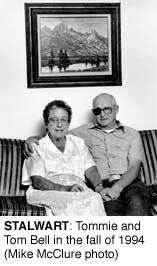 Born in Sheridan, Wyo., in 1925, Tommie met her future husband in college at the University of Wyoming. "I was president of the rodeo club and the ski club," Tom says. "So I got to date the pretty girls. When I first saw Tommie, I said, 'Who's that? I want a date with her.' " Was she an environmentalist when Tom began his long eco-odyssey? "Not at first," Tom says. "But in the end she felt just the way I did." Like many other folks, Tommie Bell was transformed by the issues and people of High Country News. Like many other folks, she made a long-term, personal contribution. Joan Nice Hamilton, now the editor of Sierra magazine, was an editor of HCN from 1973 to 1980.